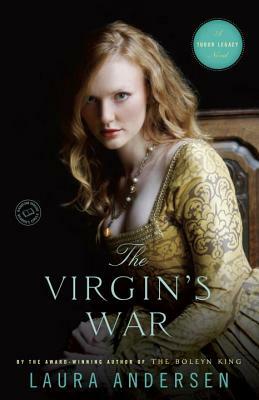 Perfect for fans of Philippa Gregory and Alison Weir, The Virgin’s War is award-winning author Laura Andersen’s gripping conclusion in the trilogy about the next generation of Tudor royals, bringing to life the drama and intrigue of Queen Elizabeth I; her daughter, Anabel, the Princess of Wales; and two countries locked in a battle for the ages. As the Spanish Armada approaches Irish shores, Elizabeth I feels the full burden of her royal office. She must not let England fall to her former husband, King Philip of Spain. And Princess Anabel, their daughter, has yet to declare with whom her allegiance—and her support—lie. Exiled Stephen Courtenay is in France with his brother, Kit, who has his own reasons for avoiding England. But rumblings of war, a sinister plot, and their loyalty to the crown call them home. Yet not even Pippa Courtenay, their sister, gifted with divine sight, can foresee the grave danger that awaits them all. As Queen Elizabeth commits her riches, her honor, and her people to the approaching conflict, she will risk everything—even her life—to preserve England’s freedom. Find your next book club pick, read special features, and more. Join the Random House Reader’s Circle. Laura Andersen is married with four children, and possesses a constant sense of having forgotten something important. She has a B.A. in English (with an emphasis in British history), which she puts to use by reading everything she can lay her hands on.